This morning I have for you a Shaped Shaker Card. My sister has a friend who's granddaughter is turning 7 soon and as most little girls is in LOVE with the movie Frozen. She ask my sister if I could make a card for her granddaughter. My sister then ask if I could make a gift and gift box for the little girl from her (my sister) these will post later this week. I think most little girls love snow globes and interactive cards. So I combined the 2. Using a image from the internet and designing card from a snow globe image from the Silhouette store this is what I came up with. The Diamond Glitter is really pretty when shaken. I love it. What do you think? This is AMAZING! Love the image and my Granddaughter would love it...she LOVES Frozen! 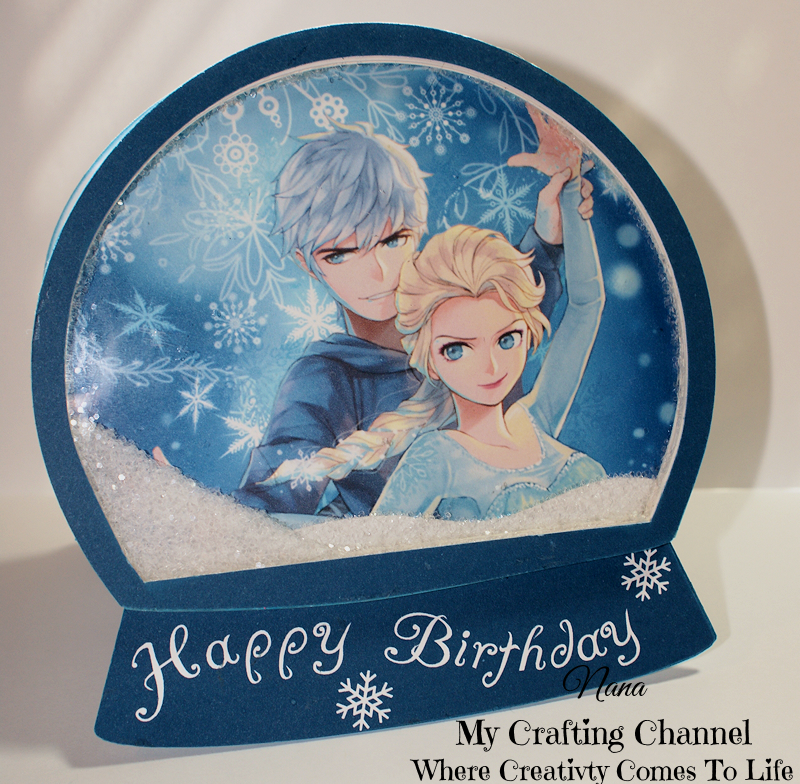 In fact, for her birthday party, the theme is Frozen...super cute card Nana! I am sure she will love it! Lois, I would more than Happy to help in anyway Just let me know. Wow, this is just beautiful! Love the image and the frosty snow! You did an awesome job! Nana this is absolutely gorgeous and every little girls dream, can't wait to see the other bits to go with it. WOW!! This is Simply Beautiful!! Precious image!! I absolutely LOVE this card!! Oh my goodness, this is amazing! I just love the way this beautiful card turned out. I love shaker cards and of course, having grandkids, I love the movie, Frozen. You created a fabulous card my friend!